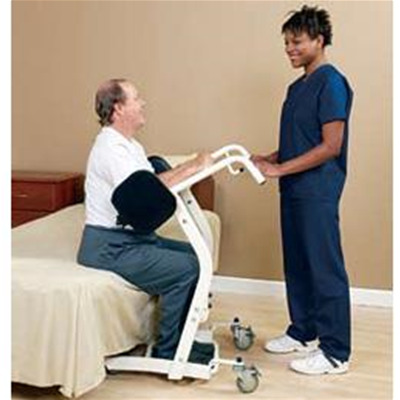 The Prism Lifts SA-400 Sit-to-Stand is an easy-to-use stand aid that engages the patient/resident and requires minimal assistance from the caregiver. The padded seat allows for easy loading and unloading. The SA-400 is designed for those who require limited assistance yet have sufficient strength and stability. This simple sit to stand solution is ideal for seat to seat transfers. Aside from being lightweight and easy to move, the SA-400 is designed for ease of use and flexibility in mind. The padded split seat and shin pads allow for a comfortable transfer for the patient/resident.